FANS CAN PRE-ORDER LOVE AND WAR NOW, AND RECEIVE TWO INSTANT GRAT TRACKS - #1 SMASH “TODAY” AND ALBUM TRACK “HEAVEN SOUTH”! On the heels of his 24th #1 hit, “Today,” topping country airplay charts earlier this week, country superstar Brad Paisley brings much-anticipated news to his fans. Paisley’s 11th studio album, LOVE AND WAR, which releases April 21, is available for pre-order now HERE. Pre-save LOVE AND WAR on Spotify HERE. As an added bonus, fans will receive “Today” and a second cut from his new album, “Heaven South,” as instant grat tracks! 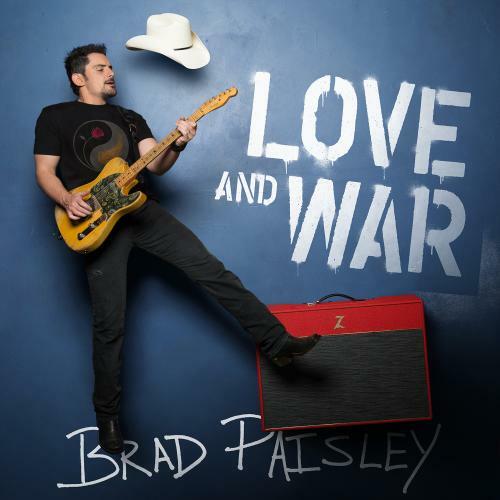 “Heaven South,” written by Brad Paisley, Brent Anderson and Chris DuBois, is one of the 16 tracks on LOVE AND WAR, all of which Paisley co-wrote.